Declining groundwater levels are common in parts of the western US, but their impact on the ability of wells to pump groundwater is not known. 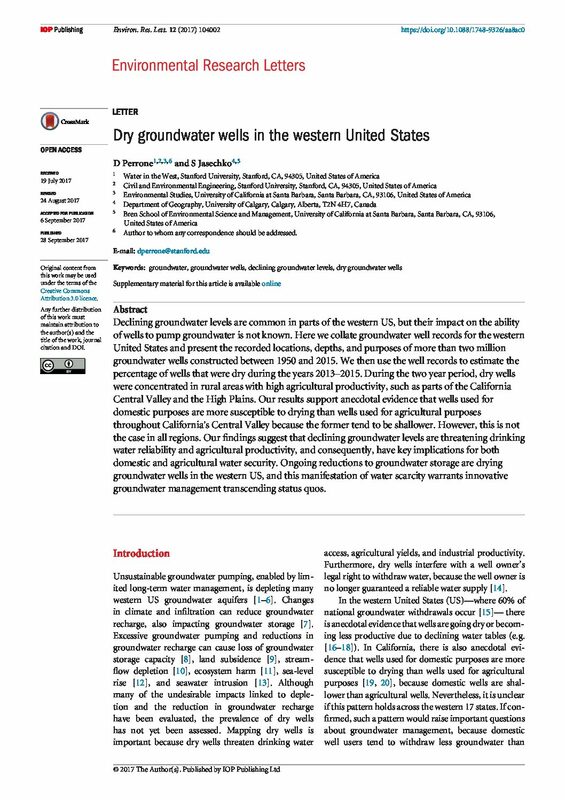 Here we collate groundwater well records for the western United States and present the recorded locations, depths, and purposes of more than two million groundwater wells constructed between 1950 and 2015. We then use the well records to estimate the percentage of wells that were dry during the years 2013–2015. During the two-year period, dry wells were concentrated in rural areas with high agricultural productivity, such as parts of the California Central Valley and the High Plains. 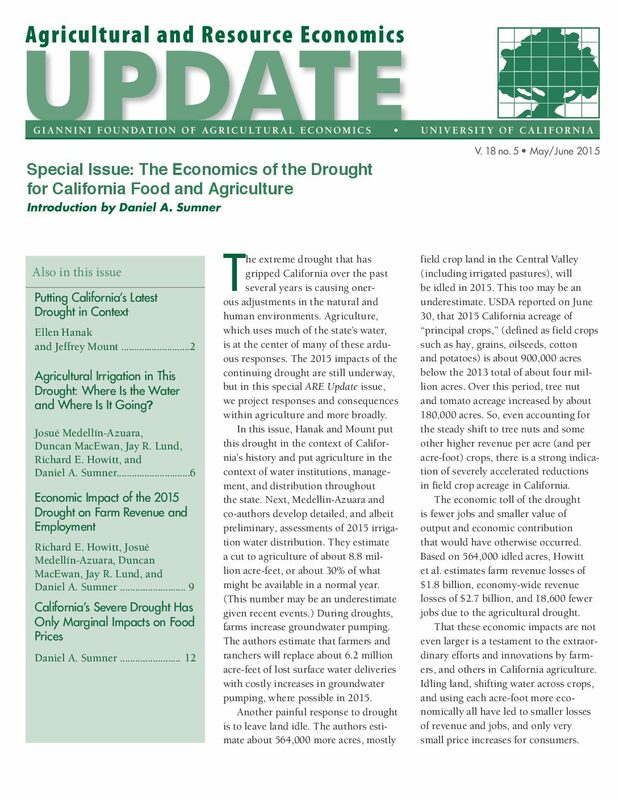 Our results support anecdotal evidence that wells used for domestic purposes are more susceptible to drying than wells used for agricultural purposes throughout California’s Central Valley because the former tend to be shallower. However, this is not the case in all regions. Our findings suggest that declining groundwater levels are threatening drinking water reliability and agricultural productivity, and consequently, have key implications for both domestic and agricultural water security. Ongoing reductions to groundwater storage are drying groundwater wells in the western US, and this manifestation of water scarcity warrants innovative groundwater management transcending status quos. The Owens Valley, a long, narrow valley along the east side of the Sierra Nevada in east-central California, is the main source of water for the city of Los Angeles. The city diverts most of the surface water in the valley into the Owens River–Los Angeles Aqueduct system, which transports the water more than 200 miles south to areas of distribution and use. Additionally, ground water is pumped or flows from wells to supplement the surface-water diversions to the river–aqueduct system. Pumpage from wells needed to supplement water export has increased since 1970, when a second aqueduct was put into service, and local residents have expressed concerns that the increased pumping may have a detrimental effect on the environment and the native vegetation (indigenous alkaline scrub and meadow plant communities) in the valley. Native vegetation on the valley floor depends on soil moisture derived from precipitation and from the unconfined part of a multilayered ground-water system. 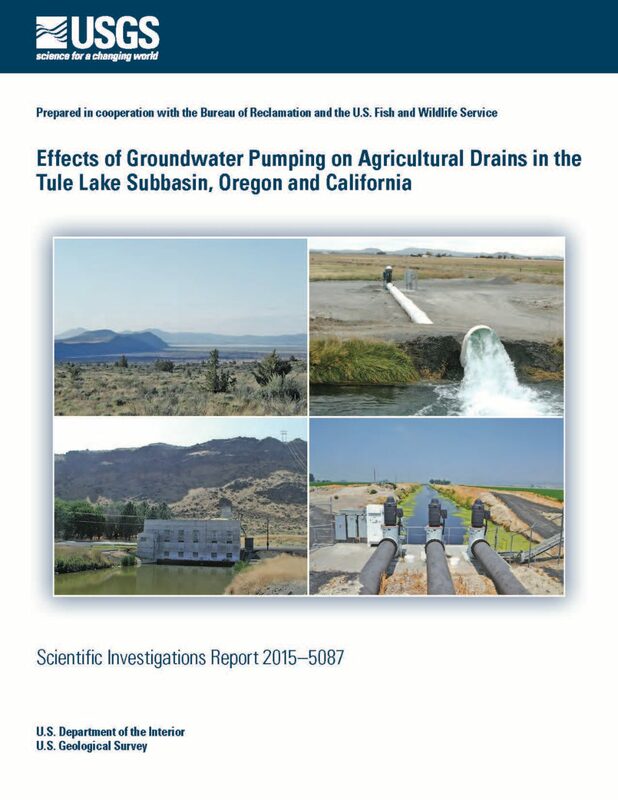 This report, which describes the evaluation of the hydrologic system and selected water-management alternatives, is one in a series designed to identify the effects that ground-water pumping has on native vegetation and evaluate alternative strategies to mitigate any adverse effects caused by pumping. The hydrologic system of the Owens Valley can be conceptualized as having three parts: (1) an unsaturated zone affected by precipitation andevapotranspiration; (2) a surface-water system composed of the Owens River, the Los Angeles Aqueduct, tributary streams, canals, ditches, and ponds; and (3) a saturated ground-water system contained in the valley fill. Analysis of the hydrologic system was aided by development of a ground-water flow model of the “aquifer system,” which is defined as the most active part of the ground-water system and which includes nearly all of the Owens Valley except for the area surrounding the Owens Lake. 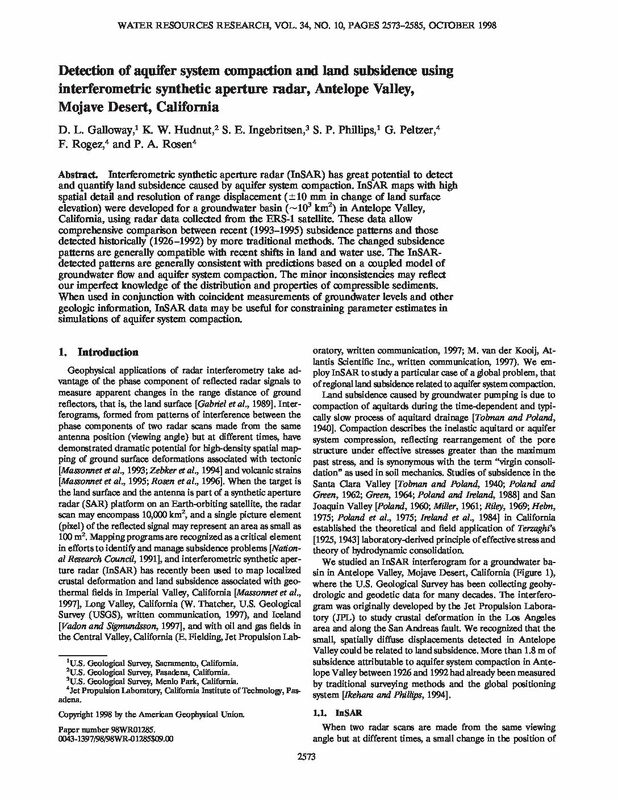 The model was calibrated and verified for water years 1963–88 and used to evaluate general concepts of the hydrologic system and the effects of past water-management practices. The model also was used to evaluate the likely effects of selected water-management alternatives designed to lessen the adverse effects of ground-water pumping on native vegetation. Water-management practices as of 1988 were defined and evaluated using the model. 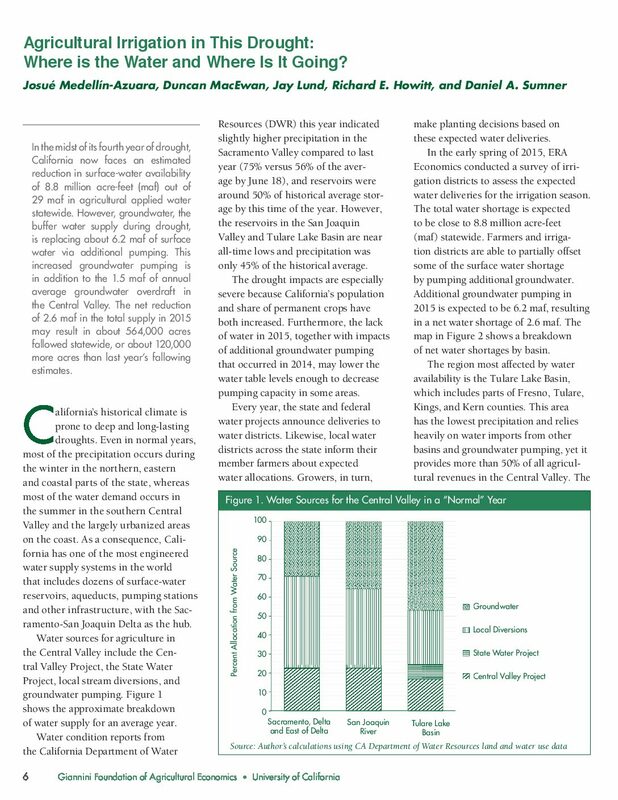 Simulation results indicate that increased ground-water pumpage since 1985 for enhancement and mitigation projects within the Owens Valley has further stressed the aquifer system and resulted in declines of the water table and reduced evapotranspiration. Most of the water-table declines are beneath the western alluvial fans and in the immediate vicinity of production wells. The water-table altitude beneath the valley floor has remained relatively constant over time because of hydrologic buffers, such as evapotranspiration, springs, and permanent surface-water features. These buffers adjust the quantity of water exchanged with the aquifer system and effectively minimize variations in water-table altitude. The widespread presence of hydrologic buffers is the primary reason the water-table altitude beneath the valley floor has remained relatively constant since 1970 despite major changes in the type and location of ground-water discharge. Analysis of the optimal use of the existing well fields to minimize drawdown of the water table indicates no significant lessening of adverse effects on native vegetation at any of the well fields at the end of a 1-year simulation. Some improvement might result from pumping from a few high-capacity wells in a small area, such as the Thibaut–Sawmill well field; pumping from the upper elevations of alluvial fans, such as the Bishop well field; or pumping in an area surrounded by irrigated lands, such as the Big Pine well field. Use of these water-management techniques would provide some flexibility in management from one year to another, but would not solve the basic problem that increased ground-water pumpage causes decreases in evapotranspiration and in the biomass of native vegetation. Furthermore, the highly transmissive and narrow aquifer system will transmit the effects of pumping to other more sensitive areas of the valley within a couple of years. Groundwater withdrawals began in 1992 from the Langford Basin within the Fort Irwin National Training Center (NTC), California. From April 1992 to December 2010, approximately 12,300 acre-feet of water (averaging about 650 acre-feet per year) has been withdrawn from the basin and transported to the adjacent Irwin Basin. Since withdrawals began, water levels in the basin have declined by as much as 40 feet, and the quality of the groundwater withdrawn from the basin has deteriorated. The U.S. Geological Survey collected geohydrologic data from Langford Basin during 1992–2011 to determine the quantity and quality of groundwater available in the basin. Geophysical surveys, including gravity, seismic refraction, and time-domain electromagnetic induction surveys, were conducted to determine the depth and shape of the basin, to delineate depths to the Quaternary-Tertiary interface, and to map the depth to the water table and changes in water quality. Data were collected from existing wells and test holes, as well as 11 monitor wells that were installed at 5 sites as part of this study . Water-quality samples collected from wells in the basin were used to determine the groundwater chemistry within the basin and to delineate potential sources of poor-quality groundwater. Analysis of stable isotopes of oxygen and hydrogen in groundwater indicates that present-day precipitation is not a major source of recharge to the basin. Tritium and carbon-14 data indicate that most of the basin was recharged prior to 1952, and the groundwater in the basin has an apparent age of 12,500 to 30,000 years. Recharge to the basin, estimated to be less than 50 acre-feet per year, has not been suffcient to replenish the water that is being withdrawn from the basin. year of natural recharge derived from precipitation runoff and as much as 40 acre-feet per year of underfow from the Irwin Basin. Between April 1992 and December 2010, an average of about 650 acre-feet per year of water was withdrawn from the Langford Basin. Groundwater withdrawals in excess of natural recharge resulted in a net loss of 11,670 acre-feet of groundwater storage within the basin for the simulation period. 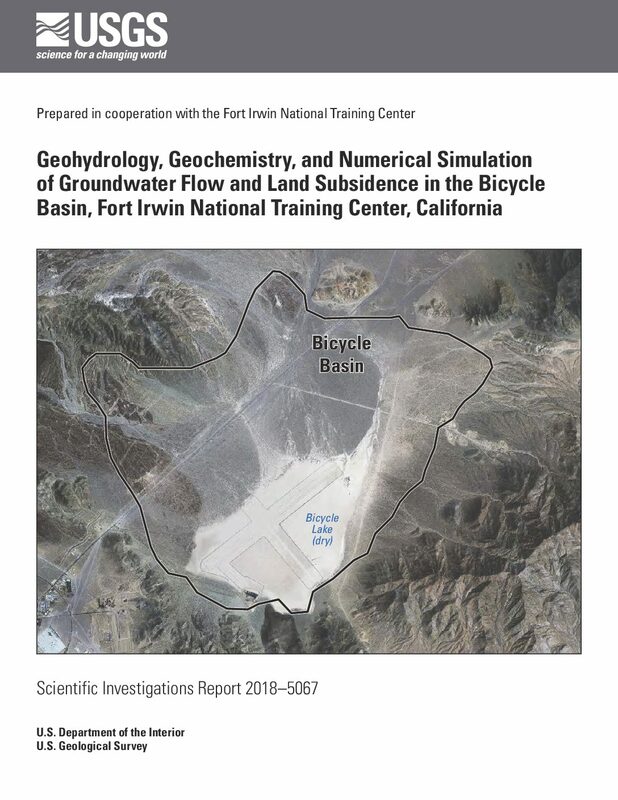 A numerical groundwater-fow model was developed for the Langford Basin to better understand the aquifer system used by the Fort Irwin NTC as part of its water supply, and to provide a tool to help manage groundwater resources at the NTC. Measured groundwater-level declines since the initiation of withdrawals (1992–2011) were used to calibrate the groundwater-fow model. The simulated recharge was about 46 acre-feet per year, including approximately 6 acre-feet per year of natural recharge derived from precipitation runoff and as much as 40 acre-feet per year of underflow from the Irwin Basin. Between April 1992 and December 2010, an average of about 650 acre-feet per year of water was withdrawn from the Langford Basin. Groundwater withdrawals in excess of natural recharge resulted in a net loss of 11,670 acre-feet of groundwater storage within the basin for the simulation period. 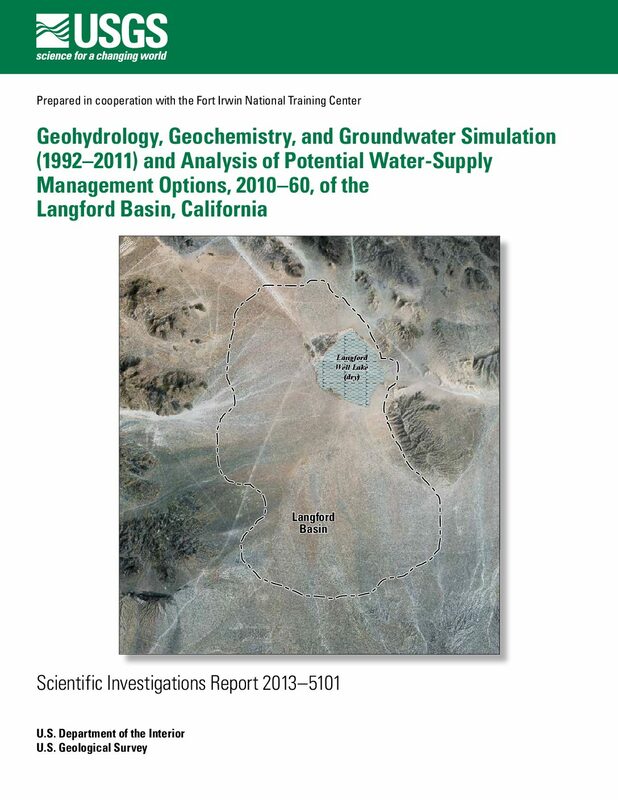 The Fort Irwin NTC is considering various groundwater-management options to address the limited water resources in the Langford Basin. 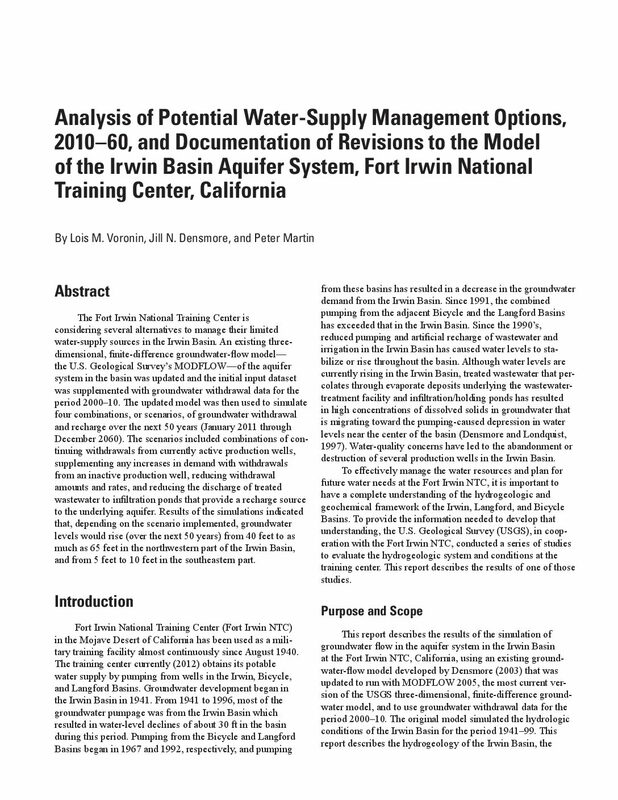 The calibrated Langford Basin groundwater-flow model was used to evaluate the hydrologic effects of four groundwater-withdrawal scenarios being considered by the Fort Irwin NTC over the next 50 years (January 2011 through December 2060). Continuation of the 2010 withdrawal rate in the three existing production wells will result in 70 feet of additional drawdown in the central part of the basin. Redistributing the 2010 withdrawal rate equally to the three existing wells and two proposed new wells in the northern and southern parts of the basin would result in about 10 feet less drawdown in the central part of the basin but about 100 feet of additional drawdown in the new well in the northern part of the basin and about 50 feet of additional drawdown in the new well in the southern part of the basin. Reducing the withdrawals from the three existing production wells in the central part of the basin from about 45,000 acre-feet to about 32,720 acre-feet would result in about 40 feet of additional drawdown in the central basin near the pumping wells, about 25 feet less than if withdrawals were not reduced. The combination of reducing and redistributing the cumulative withdrawals to the three existing and two proposed new wells results in about 40 feet of additional drawdown in the central and southern parts of the basin and about 70 feet in the northern part of the basin. These results show that reducing and redistributing the groundwater withdrawals would maintain the upper aquifer at greater than 50 percent of its predevelopment saturated thickness throughout the groundwater basin. The scenarios simulated for this study demonstrate how the calibrated model can be utilized to evaluate the hydrologic effects of different water-management strategies. 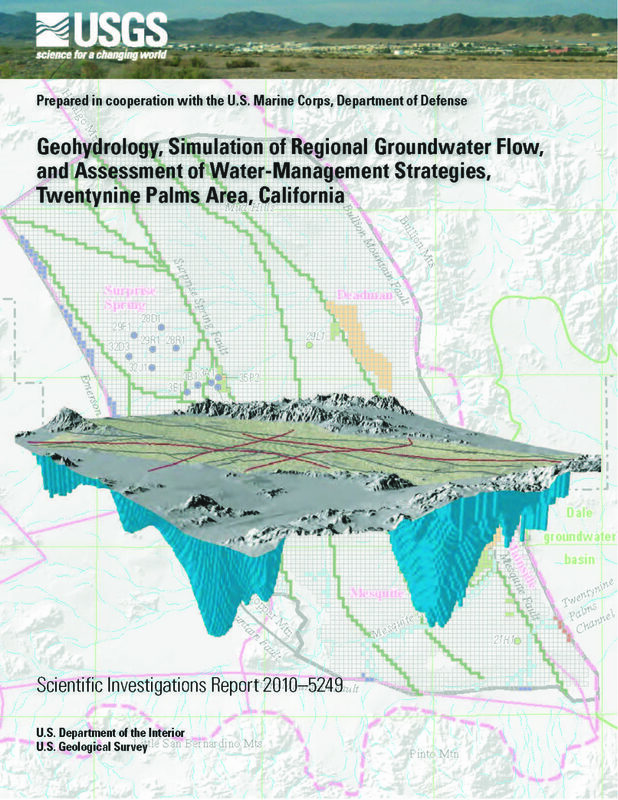 The Marine Corps Air Ground Combat Center (MCAGCC) Twentynine Palms, California, overlies the Surprise Spring, Deadman, Mesquite, and Mainside subbasins of the Morongo groundwater basin in the southern Mojave Desert. Historically, the MCAGCC has relied on groundwater pumped from the Surprise Spring subbasin to provide all of its potable water supply. Groundwater pumpage in the Surprise Spring subbasin has caused groundwater levels in the subbasin to decline by as much as 190 feet (ft) from 1953 through 2007. Groundwater from the other subbasins contains relatively high concentrations of fluoride, arsenic, and (or) dissolved solids, making it unsuitable for potable uses without treatment. The potable groundwater supply in Surprise Spring subbasin is diminishing because of pumping-induced overdraft and because of more restrictive Federal drinking-water standards on arsenic concentrations. The U.S. Geological Survey, in cooperation with the MCAGCC, completed this study to better understand groundwater resources in the area and to help establish a long-term strategy for regional water-resource development. The Surprise Spring, Deadman, Mesquite, and Mainside subbasins are filled with sedimentary deposits of Tertiary age, alluvial fan deposits of Quaternary-Tertiary age, and younger alluvial and playa deposits of Quaternary age. Combined, this sedimentary sequence reaches a maximum thickness of more than 16,000 ft in the Deadman and Mesquite subbasins. The sedimentary deposits of Tertiary age yield a small amount of water to wells, and this water commonly contains high concentrations of fluoride, arsenic, and dissolved solids. The alluvial fan deposits form the principal water-bearing unit in the study area and have a combined thickness of 250 to more than 1,000 ft. The younger alluvial and playa deposits are unsaturated throughout most of the study area. Lithologic and downhole geophysical logs were used to divide the Quaternary/ Tertiary alluvial fan deposits into two aquifers (referred to as the upper and the middle aquifers) and the Tertiary sedimentary deposits into a single aquifer (referred to as the lower aquifer). In general, wells perforated in the upper aquifer yield more water than wells perforated in the middle and lower aquifers. The study area is dominated by extensive faulting and moderate to intense folding that has displaced or deformed the pre-Tertiary basement complex as well as the overlying Tertiary and Quaternary deposits. Many of these faults act as barriers to the lateral movement of groundwater flow and form many of the boundaries of the groundwater subbasins. The principal recharge to the study area is groundwater underflow across the western and southern boundaries that originates as runoff in the surrounding mountains. Groundwater discharges naturally from the study area as spring flow, as groundwater underflow to downstream basins, and as water vapor to the atmosphere by transpiration of phreatophytes and direct evaporation from moist soil. 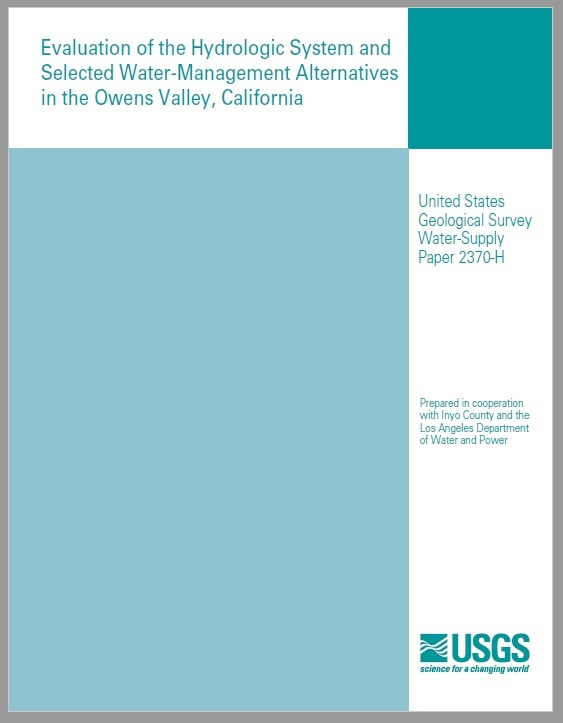 The annual volume of water that naturally recharged to or discharged from the groundwater flow system in the study area during predevelopment conditions was estimated to be 1,010 acre-feet per year (acre-ft/yr). About 90 percent of this recharge originated as runoff from the Little San Bernardino and the Pinto Mountains to the south, and the remainder originated as runoff from the San Bernardino Mountains to the west. Evapotranspiration by phreatophytes near Mesquite Lake (dry) was the primary form of predevelopment groundwater discharge. From 1953 through 2007, approximately 139,400 acre-feet (acre-ft) of groundwater was pumped by the MCAGCC from the Surprise Spring subbasin. A regional-scale numerical groundwater flow model was developed using MODFLOW–2000 for the Surprise Spring, Deadman, Mesquite, and Mainside subbasins. The aquifer system was simulated by using three model layers representing the upper, middle, and lower aquifers. Measured groundwater levels for predevelopment conditions (before 1953) and for the period 1953 through 2007 were used to calibrate the groundwater- flow model. The simulated steady-state (predevelopment) recharge was about 980 acre-ft/yr; about 90 percent of the recharge was in the Mesquite subbasin. Most of the simulated steady-state discharge occurred as evapotranspiration at the Mesquite Lake (dry). A total of about 145,450 acre-ft of groundwater was simulated as being pumped from the model domain during the transient simulation period (1953–2007); about 139,400 acre-ft of the total was extracted from the Surprise Spring subbasin. The transient simulation indicates that almost all of the groundwater pumped in the Surprise Spring subbasin comes from groundwater storage, which is consistent with the measured long-term declines in groundwater levels. The calibrated groundwater model was used to evaluate the potential effects on water levels and aquifer conditions in the Surprise Spring, Deadman, Mesquite, and Mainside subbasins for water-management strategies being considered by the MCAGCC to meet the projected water demand at the base for 2008–2017. One of the main objectives of the water-management strategies is to reduce pumpage from the Surprise Spring subbasin. Reducing groundwater pumpage in the Surprise Spring subbasin by about 38 percent (about 1,345 acre-ft/yr) substantially decreased or reversed simulated hydraulic-head declines in the subbasin. Redistributing about 15 percent of the 2007 groundwater pumpage (about 550 acre-ft/yr) from the Surprise Spring to the Mainside subbasin resulted in more than 60 ft of simulated declines in hydraulic head in the Mainside subbasin by 2017; however, redistributing about 22 percent of the 2007 pumpage (about 800 acre-ft/yr) from the Surprise Spring subbasin to the Deadman subbasin resulted in 5–10 ft of simulated hydraulic-head decline in the Deadman subbasin. The water-management scenarios simulated for this study demonstrate how the calibrated regional model can be utilized to evaluate the hydrologic effects of a water-management strategy.